The Accord is simply the best height adjustable desk on the market. The Accord L-Shape Small is for desktop size minimum 1350 mm to no more than 1600 mm in length for either left & right hand sides. Imported exclusively by Ergolink this addition to our range has an incredibly whisper quiet operation via its three high quality actuators (1 in each leg). 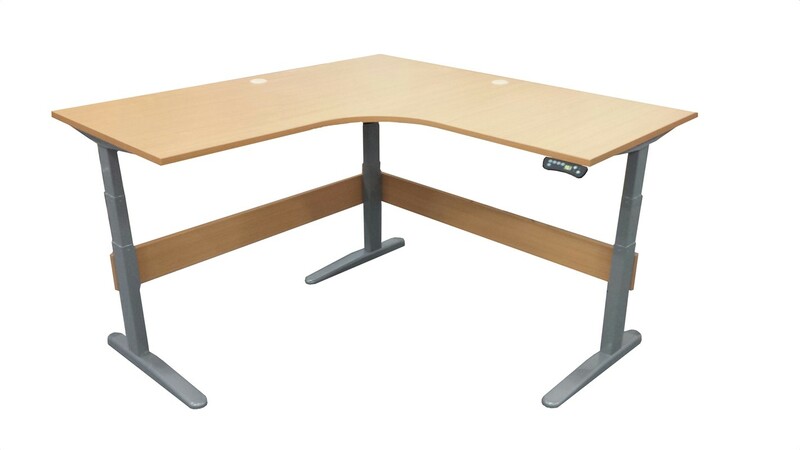 Customise the top for any desk size 1600 mm or less on either side. Pick your desktop colour to match your decor. Comes with 2 x modesty panels to provide privacy for the user but also to provide rigidity to the frame, extending the life and performance of the desk. Suits the smallest or tallest operators with ease, and avoids all of the issues associated with desktop units. With a weight capacity of over 165 kg it is perfect for any office or industrial application. Low Profile Heavy Duty feet an option for high traffic areas or industrial situations. Digital display of the current height.